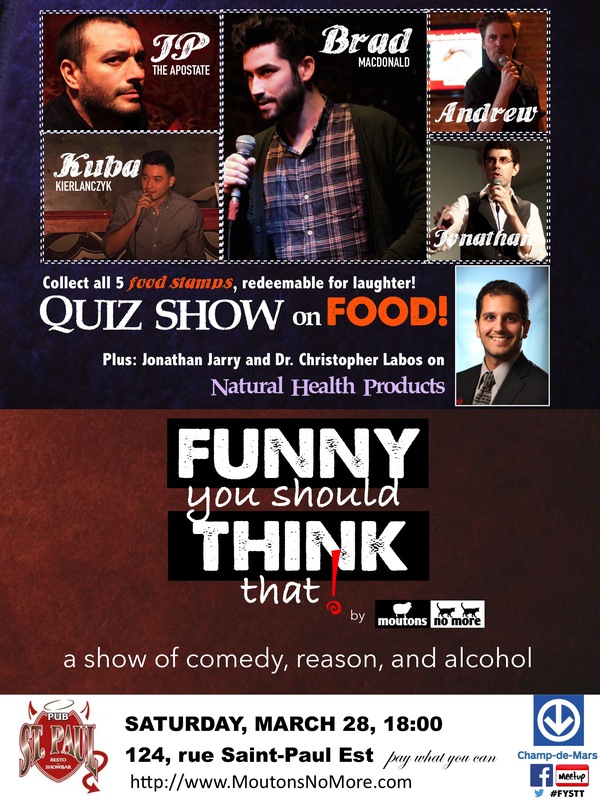 A little plug for the show I’m hosting in a week. It’s all about science… and entertainment! 6:00 – 7:00: Come and order food and drinks, relax, talk with us, while something skeptical, rational, and entertaining plays on the stage television. 7:00 – 8:30: Moutons No More entertains you like no others with its show. 8:30 – midnight: Stick around as long as you want and talk! FYSTT is more than a show: it’s also a place to come and talk to other like-minded and on the cusp-of-being-like-minded individuals. Tags: alternative medicine, doctor, education, health, humour, medicine, moutons no more, nutrition, podcast, pseudoscience. Bookmark the permalink.